If you love loft spaces, industrial design and the like, I’m sure that you’d enjoy the next pictures that we will be presenting you because of how awesome they are! Exposed or open ceiling designs doesn’t really appeal to everyone as every other archetype there is. But they are interesting in a sense that it seems like they are showing off something. 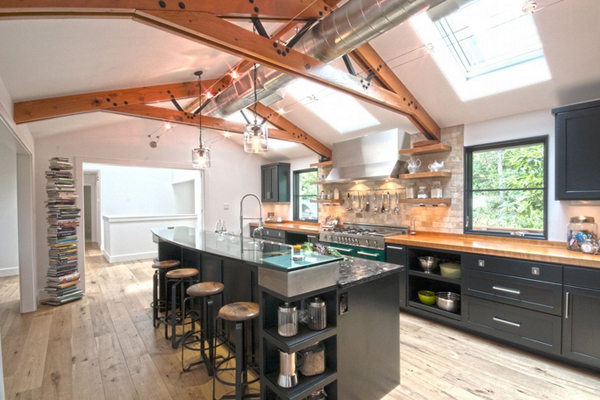 Below is a list of 20 Awesome Kitchens with Exposed Ceilings. 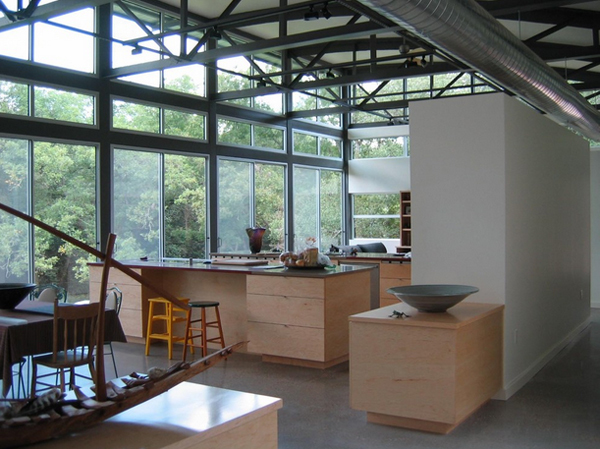 This list will open your eyes to love the industrial designs that each space has. You will notice that some of the spaces here are actually contemporary but with the use of exposed ceiling as part of the design, the spaces created are just adorable and charming. Check out the list below. 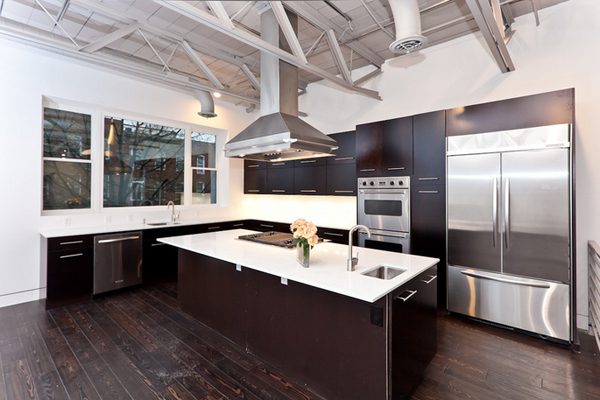 This contemporary kitchen has loft feel with black cabinets, a concrete counter top on the kitchen island, stainless steel fixtures, corrugated steel ceiling panels, and a glass garage door opening to the backyard. 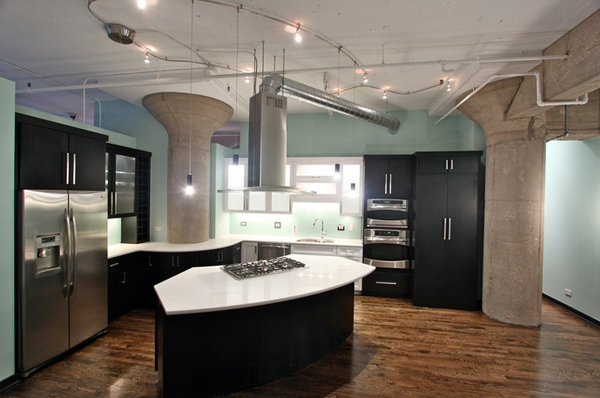 Black island with white counters – like the chairs but would want them to swivel. 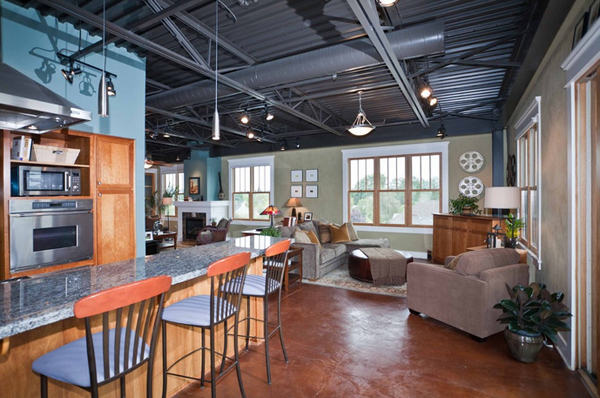 Love the concrete floors, wood counters, tin roof and the huge sink! 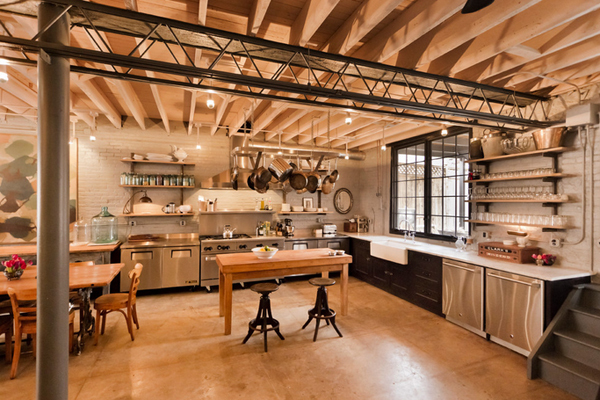 This former carriage house left over from the bootlegging days of Washington, D.C., got an industrial makeover. Most of the shelves hanging on brackets are original to the building. 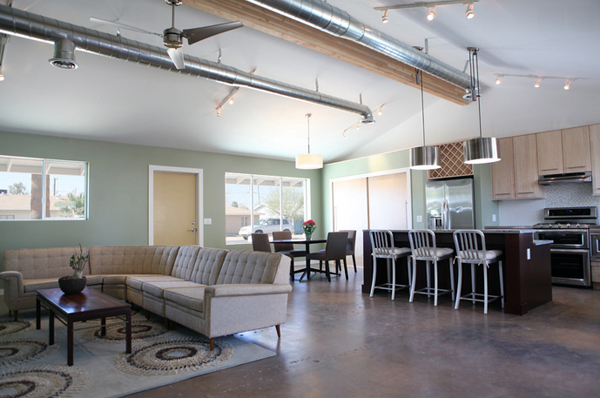 Look at the clean look of the exposed floor on the ceiling; industrial spaces does not need to be this stunning. Layers of paint and drywall have been removed revealing the original timber beams and masonry walls while accommodating two bedrooms, master suite, and a lofty, open living space at the ground floor. 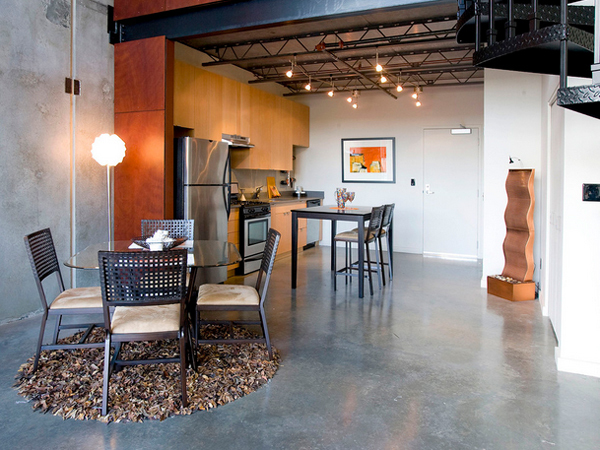 This is the model unit for modern live-work lofts. 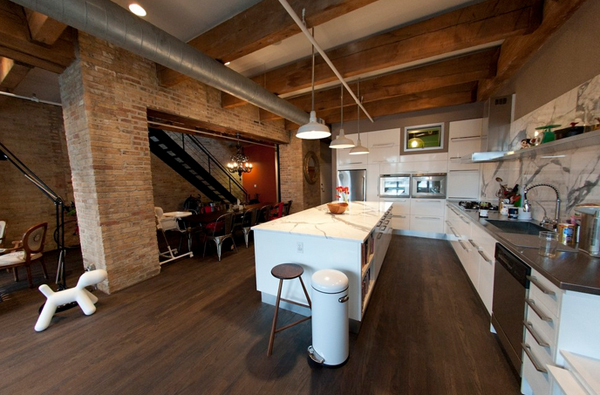 The loft features 23 foot high ceilings, a spiral staircase, and an open bedroom mezzanine. 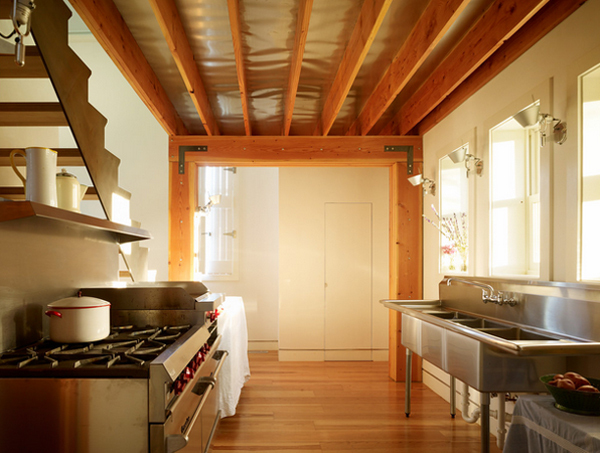 In wood-happy spaces, big shimmering metal accents help break up the material palette. This project was a long labor of love. 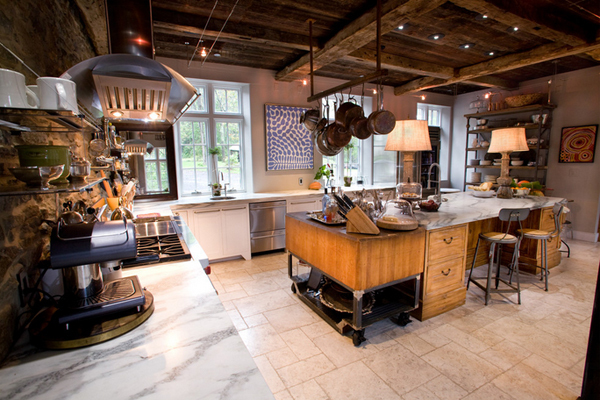 The clients adored this eclectic farm home from the moment they first opened the front door. They knew immediately as well that they would be making many careful changes to honor the integrity of its old architecture. 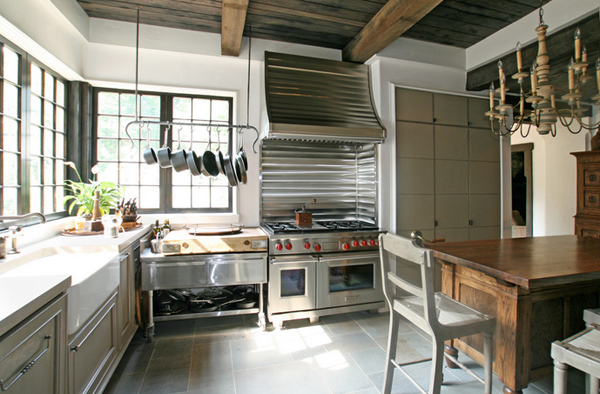 The chopping block next to range with hanging storage for the pans is just cute! 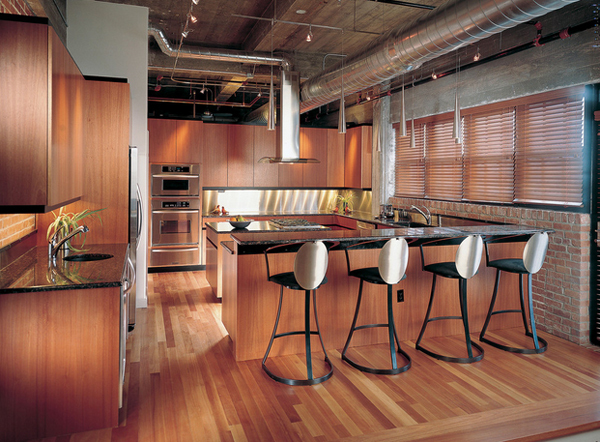 Dark cabinets and open concept with windows – totally love this! 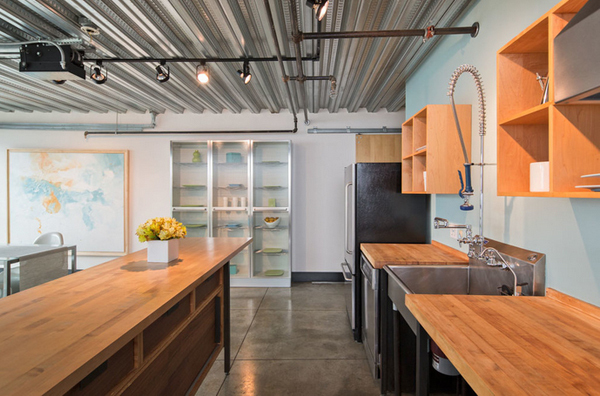 Look at the aluminum casing on the ceiling to keep the wiring of this Austin kitchen. To lower costs in another project, Costello went with an off-the-shelf-type duct. To make it unique, though – and not take away from the wooden support beam – he split the system into two smaller ducts rather than having one large one. Downstairs the kitchen is simple but functional. Melander didn’t want this new necessity to interfere with the main space, but he also needed it to be easily accessed. Tucking it behind the staircase and fireplace helped accomplish both. Sconces act as task lighting when needed but also provide ambient lighting reflected up toward the ceiling. 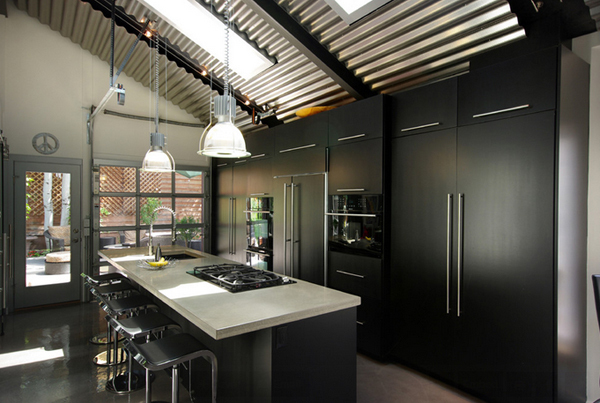 I know that we are talking about the exposed ceilings here, but don’t you just adore the black cabinets in here? 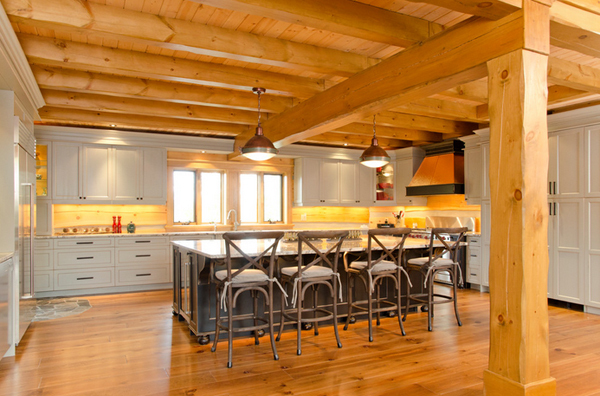 Exposed beams, counter/bar with seating and the color highlights! 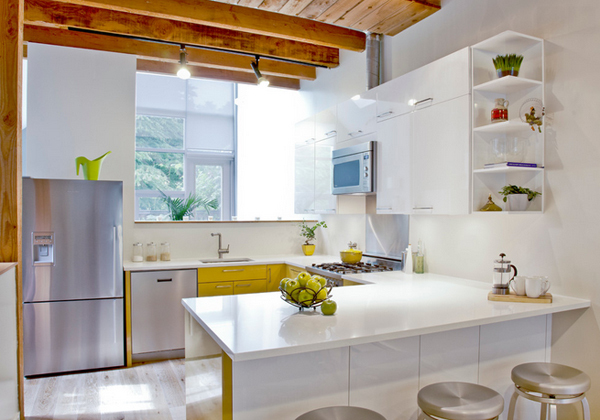 I just love this Vancouver space! Interesting lighting and painted ceiling and pipes! The metal pipe running straight through the house is just stunning! The ceiling is a great place for incorporating contrast, too. 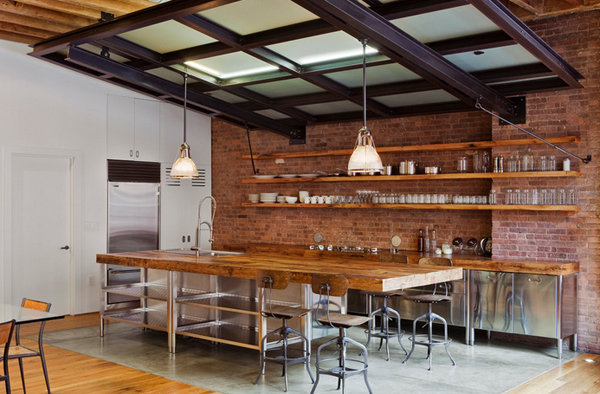 While this kitchen says urban country, the ceiling screams modern industrial. 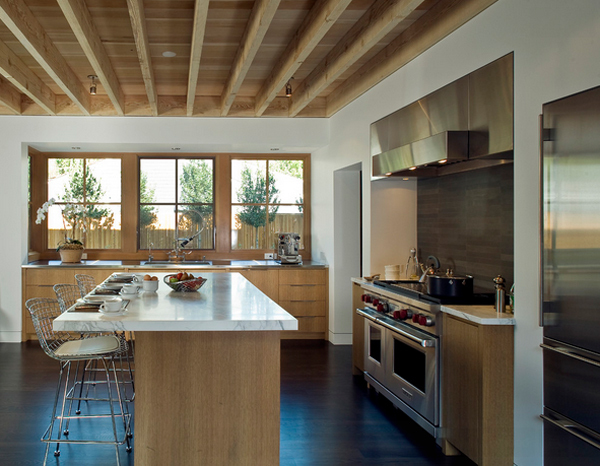 Whatever the primary design concept of each of the kitchen in this list, we now know that with the exposed ceiling, they created an awesome vibe that makes it casual but still as stunning as when the ceilings are actually closed. 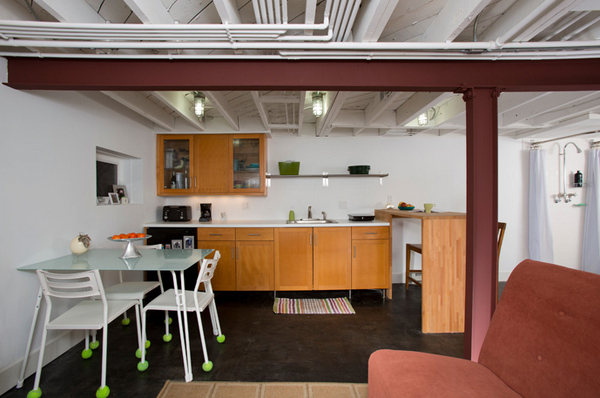 Some spaces would also have exposed beams – well, expect that each space is as awesome as the next, check them out too!